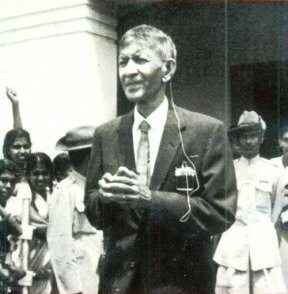 Samuel James Velupillai Chelvanayagam was born in 1898 March 31st in the Malaysian State in the town of Ipoh. In Malay language the word Ipoh conveyed the meaning as the cleanest city. Perhaps it was the fitness of things that late Mr. Chelvanayagam’s life was marked by a cleanliness unknown in contemporary politics of Sri Lanka. Mr. Mervyn De Silva, the then Editor of Ceylon Daily News, has written that Chelvanayagam known for his physical frailties is known in Jaffna as “The Uncrowned King of the North. He also added “that even the worst opponents of Chelvanayagam will willingly testify to his Integrity”. J.R Jayewardene, by no imagination the lover of the Tamils Could not resist paying the best tribute. In his vote of condolence to Chelvanayagam in the Parliament, he said “I have not met anybody in my community or any other community who said that Chelvanayagam would let you down”. Peter Keuneman, on behalf of the communist party, described “Chelvanayagam as a man of personal and political integrity”. Mr. Chelvanayagam, though born in Malaysia was brought up in Jaffna. He had his first education at Union College, Tellippalai and then at St. John’s College. Jaffna. I too feel privileged that I had my education at St. John’s College, Jaffna. Later, Mr. Chelvanayagam had his education at St. Thomas College, Mt. Lavinia. Rev. S.K Ponniah was his guide and advisor in the early days of Chelvanayagam’s career. Chelvanayagam graduated in Science as an external student of the University of London around 1918. He started his career as a Teacher at St. Thomas College, Mt. Lavinia, but his career came to an abrupt end when the Principal refused to grant him permission to visit his brother who was seriously ill. Typical of Chelvanayagam he resigned his post. Then, he joined Wesley College, as a Teacher and prepared for his Law examinations. Here too I feel proud that I am an old boy of Wesley College. In the early fifties as a Wesley college student and as the President of the Tamil Association, I invited Mr. Chelvanayagam to give a talk under the title (Case for a Federal Constitution in Ceylon.) His thought provoking speech was well received by the Principal, Teachers and Students of Wesley College, Chelvanayagam specialized in civil law and he often used to say this has made him as a learned in Law. His mastery of civil law earned a respect of all the Judges before whom he appeared. In this context, I am reminded of what he often said to me with a twinkle in his eye “for the love of words. I was not prepared to lose my case”. Brevity is the soul of wit and Chelvanayagam excelled in this art. Chelvanayagam was married to Emily Grace Kumarakulasinghe a product of Uduvil Girls College. He had a daughter and four sons. His Daughter Susili was married to Dr. Jayaratnam Wilson, who was at the Peradeniya University and later Headed the Political Science Department, at the New Brunswick University in Canada. He was an outstanding scholar in Political Science. Though he brought out innumerable publications on the Sri Lankan Tamil Problem the following books receive our attention – S.J.V Chelvanayagam and the crisis of Sri Lankan Tamil Nationalism 1947 – 1977 the political biography and The Break up of Sri Lanka -The Sinhala Tamil Conflict. Words though beautifully worded may vanish into thin air. Chelvanayagam was very conscious that the thoughts on the Tamil Problem must get recorded and documented. It is in this context he started the Newspaper “SUTHANTHIRAN”. This newspaper is a record of the Tamils struggle for liberation. Many of the LTTE Leaders have openly declared that Suthanthiran News Paper was a source of inspiration for our Freedom struggle. The last editor of the Suthanthiran Newspaper, Kovai Mahesan’s contributions to our liberation struggle was not only a source of inspiration to our Freedom struggle but he had become part and parcel of our history. Mr. Chelvanayagam was the founder of the llanakai Thamil Arasu Kadchi and the co-president of the the TULF. For record purposes it may be added that I was the President of the Colombo branch of the TULF. Many eminent personalities who are making and unmaking history, addressed the meetings at the Colombo Branch of the TULF, Which was housed at his residence in Colpetty. Chelvanayagam was above all an undisputed beloved leader of the Tamils. He had thrown away his mortal frame and has gone to the land of no return. He passed away on the 26th of April, 1977 roughly a month after the freedom lovers have celebrated his entry to his 80th year in March 31st 1977. Mr. Chelvanayagam, though very old and in declining health, he was not classified as a person who had outlived his usefulness. It was strange but true, even contradictory forces valued his presence in Tamil Politics as the main unifying factor. In fact, the death of Mr. Samuel James Velupillai Chelvanayagam, as his full name goes, removed from the political scene, the fatherly figure who was respected, loved, admired and venerated by all irrespective of their political ideologies. Many leaders were respected and admired but few have been venerated. Mr. Chelvanaygam ranks foremost amongst them. Politics is a dirty game, but it must be said to his eternal credit, that he purified it to a very great extent. When many politicians formulated policies to suite the next election. Mr. Chelvanayagam thought and acted in a manner that would give an everlasting solution to the future generations. That is why he was not classified among other ordinary politicians. He was an ascetic, saint, and a statesman of colossal stature. In fact, he was a leader who could not be bought over for the plums of office. Mahatma Gandhi was considered a dangerous enemy because women, wine, wealth and power could not buy him over. Likewise, Chelvanayagam was a dangerous enemy to the Sinhalese, because none dare to buy him over. He spoke less and wrote less, but his thoughts were profound. Every word he uttered was measured and meaningful. His concern were more to the content of words than the beauty of words. A Leader must lead and never be led. In keeping with this concept he led the Tamil Masses and he was never led by them. But, as true leader he was always conscious of the aspirations of the masses. He read their pulse in a perfect manner. Mr. Chelevanayagam really entered politics when he was 45 in the year 1944. It coincided with the arrival of Soulbury Commission. His hold on the Tamil Masses and the respect he has earned from non Tamils and his political opponents continued undiminished. That speaks for the quality of the man. The Sinhalese political parties and the Sinhalese masses, though opposed to his political philosophy felt, his continued presence necessary to prevent Tamil “Extremists” taking an upper hand. The Tamil youths remember with deep gratitude his political vision and prophecy. We fear to think as to what would have happened to the Tamils if he had not entered the political scene in his mid forties to guide them. It won’t be considered an exaggeration to say that if he had not taken to politics. Not only the Tamils rights and even the Tamils as an entity would have ceased to exist. Ceylon had witnessed the birth of innumerable politicians but it is not difficult to count the number of Statesmen produced by this island Mr. Chelvanayagam ranks foremost among the statesmen Ceylon has produced After Sir P. Ramanathan and Sir P Arunachalam. The vacuum that was created though filled to some extent by the Late G. G Ponnambalam, was not sustained by him. Mr. G.G Ponnambalam was two years junior to Chelvanayagam! But he accepted his leadership because he had all the qualities of a leader, But, when he found that he did not possess even a tincture of honesty he parted company. It is to the eternal credit of Chelvanayagam that he has filled this void in a most able manner. Though Mr. Chelvanayagam may not have attained such eminence as, Pon. Ramanathan and Pon. Arunachalam, yet he stands unique for his political vision, sagacity and honest conviction. It was a Herculean task he has to perform to convince the Tamils of the dangers that were in store for them. The Tamils are now convinced as to what political philosophy they should adopt if they are to survive in this country as a separate entity preserving their language, culture, civilization and their way of life. As to how much our Sinhalese brothers are convinced about our problems and as to how far they are prepared to concede our rights remains a debatable point. But it is beyond doubt that all Sinhalese are now convinced, though they may not admit openly, that there is a gigantic Tamil problem and it should be solved if there is to be real peace, harmony and progress in the country. This was not an easy decision. For Chelva, it was a very painful decision, knowing the consequences for implementing the same. Very often in his public pronouncements he has said that to gain freedom the Tamils must be prepared to undergo untold sufferings in the process of which they may even have to embrace death.He compared the present plight of the Tamils to a cankerous growth in our body. As all medicines and injections have been tried and failed we have left with no alternative but to perform an operation fraught with danger. But if the operation is not performed, death awaits the Tamil patient. He appealed to us to try this method and we have determined to follow him though he is no more with us. There was a finality and fitness to his conclusion. He said we have abandoned the demand for a federal constitution our movement will be all non-violent, we know the Sinhalese people will one day grant our demand and we will be able to establish a separate state from the rest of the Island. To quote his son-in-law, Dr.A.J Wilson, this is what he says “Whatever the comfortable Tamil Middle class residing in Colombo said,Chelvanayagam’s last testament was that only a Tamil State could protect the Tamil’s from repression by the Sinhala state apparatus”. When asked by a journalist how the TULF would achieve its goal. Chelvanayagam replied prophetically; “We will make such a nuisance of our-selves that they the Sinhalese will throw us out”. “Mr. Chelvanayagam’s goal was ratified in the Vaddukoaddai resolutions of 14th May 1976 at the first national convention of the TULF under Mr. Chelvanayagam’s Chairmanship. This historic pronouncement accused the then Prime Minister Mrs. Bandaranaike of having callously ignored the TULF last attempt… to win constitutional recognition of the Tamil Nation without jeopardising the unity of the country. The conventon called on the Tamil Nation in general and the Tamil youths in particular to come forward to throw themselves fully in the sacred fight for freedom and to flinch not till the goal of a Sovereign Socialist State of Tamil Eelam is reached. “Vaddukoaddai Resolution was followed by a Trail at bar, presided by five Judges and 65 Tamil Lawyers appeared for the case. Here, Mr. M Thiruchellvam, Q.C an eminent Constitutional authority argued in this following memorable manner “The Sinhalese never conquered us, nor did we give our consent to the Sinhala rule, nor there was a continuity of the Sinhala rule. What we ask is what we had, what we lost, we want to regain. It comes within the category of restoration or reconstitution. The word separation is a misnomer. He even further added on a comparative basis that though the Tamils of Tamil Nadu are numerically higher than the Tamils of Tamil Eelam and though Tamil Nadu is a big country, Tamils in Tamil Nadu ceased to rule themselves from 1337, in the beginning of the 14th century, but the Tamils of Eelam maintained their contiguity of their rule till 1803 the beginning of the 19th century. The last Tamil King was Pandara Vanniyan. Mr. Chelvanayagam was a man of few words and deep thought he was an outstanding civil lawyer. Unlike some lawyers who for their love of words have lost their cases, Mr. Chelvanayagam was extremely careful in choosing his words. In fact every word was measured and uttered. If ever he was guilty of anything when choosing his words it was more a case of understatement than overstatement. It was often said that he used biblical language. At the negotiation Table he was at his best. He was a hard bargainer who never yielded on fundamentals. The BC pact was a classic example of his grasp of the essential. Though Mr. Chelvanayagam was often compared with Gandhi for his political honesty. It would not be wrong to compare him with Jinnah for the grip and determination and for his unyielding attitude on fundamental issues. Typical of an able civil lawyer, he knew how and where he should lay the stress. Among the Tamil Leaders only few have emphasized the preservation of the Traditional Homeland as an essential ingredient for the survival of the Tamil Community. Mr. Chelvanayagam excelled in this thinking far above all leaders. “What the body is to a soul is the land to a linguistic group It is necessary for itsself expression”. This undeniable truth had been repeatedly emphasized by Mr. Chelvanayagam and the Tamils are now much more conscious than any other issue that is facing them. In keeping with Chelvanayagam’s thinking his followers in the party have made clear cut pronouncements as to the land being snatched away from the Tamils. His Lieutenant, Dr. E.M.V Naganathan, in his inimitable style said in Parliament, “birds have their sanctuary, animals have their wild life reservation, but Tamils are deprived of their territory”. It was a statement that came from his inner depths. The man was frustrated that his community was driven away literally from their bearings. 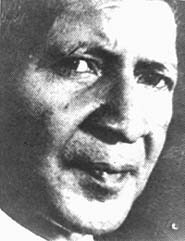 Mr. C. Vanniyasingam the founding member of the Federal Party. President of the Thamil Arasu Kadchi and a MP a puritan, and a devout adherent to S.J.V. Chelvanayagam had observed that “on every occasion in which the Tamils were at the receiving end of a thrashing, they were able to seek refuge in the North and the East. If these provinces failed to provide a haven, a sanctuary for the Tamils, which way they can thay turn? Except to drown themselves in the Indian Ocean”. Mr. S. Kathiravetpillai, the theoretician of the Tamil Liberation Movement made it clear that he would prefer to keep the Tamil areas under developed or undeveloped than be developed and be deprived of our homeland. He also added that we are not losing the Tamil land but also the sea surrounding the Tamil Eelam. Mr. V. Navaratnam, the brain of the Ilankai Thamil Arasu Kadchi who drafted the Banda-Chelva Pact and the author of the ‘Fall and Rise of Tamil Nation’ and the mentor of Mr. Prabakaran have spoken in clear cut terms ‘the value of the Land as a must for the survival of the Tamil nation’. “In 1675 The Dutch Governor Van Gones (SR) confirmed that the Northern and Eastern Provinces were inhabited by the Tamils. At the census of 1827 taken by the British there were no Sinhalese. Who were at that time was counted as Buddhist in the Batticaloa District. There were 19,095 Hindus, 8288 Moors (Muslims) in the same census in Trincomalee district only contained 250 Buddhists. British data indicate that in 1881 there were 5012 Sinhalese in the Batticaloa district, out of a total population of 105.358 or 4.8% of the population. In 1891 the Sinhalese were 5.2%, in 1901 5.2% in 1911 3.7%, in 1921 4.6% and in 1946 two years before Independence 5.8%. In contrast, the Tamils in 1881 constituted 57.9% in 1891 56.7%, in 1901 55.0% in 1911 54.5%, in 1921 53.3% and in 1946 60.3%. In the Trincomalee district the Sinhalese numbered 4.21% ,in 1881, 4.3%, in 1891. 4.2%, in 1901, 3.8%, in 1911, 4.4% in 1921 and 15.3% in 1946. The total Sinhala population has never exceeded 1200 during the British period. It is equally noteworthy that in 1946, out of 279,000 persons in the whole of the Eastern Province, no more than 23,000 were Sinhalese. The Demographic changes took place after Independence. When the state apparatus came to be controlled by Sinhala chauvinists. politicians and bureaucrats. The multi-purpose river valley scheme in the Amparai District of the Eastern province created in 1963 brought in a flood of Sinhalese colonists. By 1981, 157,000 Sinhalese colonist had settled, not as a result of any spontaneous movement of population but under pressure of various inducements offered by Sinhalese governments The Tamils and Muslims were not given equal consideration. These Sinhalese colonies now constituted 21.8% of the population. One way out of the problem would be an exchange of population, but the land the race, and the faith, lead by the sections of Sinhalese Buddhist clergy. Sirimavo Bandaranaike and the ruling United National Party would not countenance an amicable arrangement of the kind. All what Chelvanayagam feared about state sponsored Sinhala colonisation have been proved right. Mr. Chelvanayagam was charged as a prophet of Gloom but all his prophecies have been proved right. Dr. A.J. Wilson says that the parition of Ceylon is already a fact of history. “The war the Sinhalese have launched may take several years for a final decision. The longer it takes the more likely it is that a separate state will emerge. In the interim it is probable that patch work compromises will be implemented with New Delhi acting as a monitoring agent. But, this cannot continue forever. Compromised agreements will as history has repeatedly shown will not to be honoured on a permanent basis. But, the war will be resumed. The Partition of Ceylon is already a fact of history. This is not an emotional outburst of an ordinary individual, or a third class politician. It is a clear cut pronouncement of Dr. A.J. Wilson, the world renowned political analyst. In conclusion it may be said Chelvanayagam was a rare phenomenon in Ceylon politics, a type of which may not appear in the future. Whether anyone agreed with his political philosophy or not, it is readily accepted that his impact is permanent in the political spear of the country. Mr. Chelvanayagam was essentially a man of peace. He liked to find a solution to the problems in a peaceful manner. But he did not desire the dreadful peace that prevails in the graveyard. He wanted peace with honour. He was a political prophet nay a Messiah who has shown the promised land to the Tamils. It is left to the Tamils to achieve it. What Velupillai Chelvanayagam envisaged Velupillai Prabakaran was determined to achieved it. Eelam is a reality ‘No’ power on earth can prevent this. The alternative for Tamil Eelam is Tamil Eelam. According to Rt. Rev. D.J. Ambalavanar “Chelvanayagam died like Moses himself without reaching the promised land, but the vision he saw he leaves behind as the heritage and challenge to his people”.